The GO-2400-PGE combines the Go Series’ size and affordability with the remarkable low noise technology of the Sony IMX174 imager to produce best-in-class image quality in an entry-level package. A single-channel, Power-over GigE Vision interface delivers 2.35-megapixels of resolution at up to 48.8 fps, depending on pixel format. Two models are available with the GO-2400M-PGE providing 8-bit, 10-bit, or 12-bit monochrome output, while the GO-2400C-PGE offers 8-bit, 10-bit, or 12-bit raw Bayer color output. Full resolution is 1936 x 1216 pixels, with flexible ROI capabilities to allow users to window the output to smaller sizes for increased frame rates or to take advantage of smaller lens formats than the camera’s full 1/1.2″ C-mount format. Despite its small size and weight, the GO-2400-PGE carries the same industrial grade specifications as other Go Series cameras, including an 80G shock rating, 10G vibration rating, and a standard operating temperature range of -5°C to +45°C. 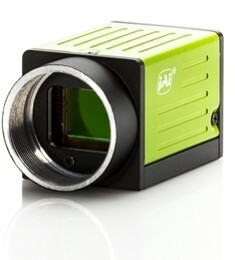 A high-performance global shutter supports speeds as fast as 38 µs. Other standard features include pixel blemish compensation and shading correction functions, a built-in 256-point look-up table for gamma customization, and a multi-ROI mode supporting up to 5 overlapping regions within a single frame. Monochrome models are also equipped with a binning function (1×2, 2×1, 2×2) for increasing pixel sensitivity. The GO-2400-PGE also includes JAI’s Auto Level Control (ALC) that combines auto gain and auto shutter capabilities in an integrated function to let users optimize their auto exposure control for lowest noise, fastest shutter, or other priorities. Power can be supplied through the GigE Vision interface or via a 6-pin Hirose connector which also provides connections for external triggers and GPIO. With their small size and high image quality, GO-2400-PGE cameras are well suited to a wide range of applications including medical and scientific uses, as well as robotics and high precision inspection systems.